Both industries share many early-day challenges including branding and distribution. Nearly 500 people, a little more than half of them from the wine industry, were expected at the second annual Wine & Weed Symposium in Santa Rosa, California, on Thursday, August 2, according to event founder George Christie. Christie, president and CEO of the Wine Industry Network, said people had come from Florida, New York, Virginia and Illinois as well as Colorado, Oregon and Washington State to learn about opportunities in the cannabis industry for wine professionals. “This year, we’re focusing on what each industry can learn from the other. 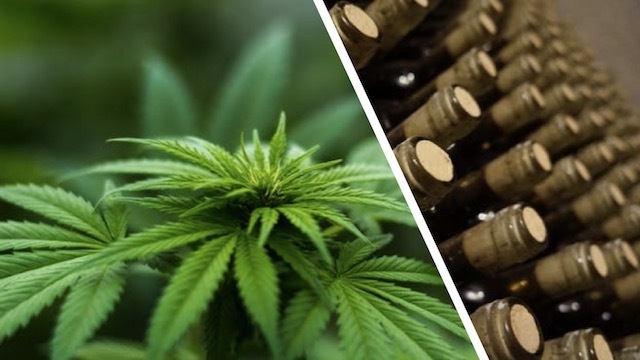 There are a lot of people in the cannabis industry that can learn from small wine producers who have been able to be sustainable and successful with limited resources against giant wine companies,” Christie told Wine Enthusiast. Federal law, which continues to list marijuana as an illegal substance, has prevented national banks from offering services to businesses in the cannabis sector. Tammy Boatright, president of VingDirect in Sebastopol, California, shared her knowledge of how to build a brand and distinguish it from the other products on the shelf because “right now, the cannabis industry seems to me to be what the wine industry was back in the’70s and’80s. There was a lot of Russian River Chardonnay selling at $25 a bottle. They were all $25, and they were all from Sonoma and they were all Chardonnay. It was very much—especially in the early days—a commodity. And that’s where weed is today. “Weed is not distinguishing itself at the retail level at all. It is about purchasing a product that a consumer, in my opinion, has very little loyalty to,” says Boatright, who spoke on Direct to Consumer Marketing & Small Producer Strategies for Success. Flash forward 40 years in the wine business and there are iconic Chardonnays that are fetching far more than $25 a bottle. That is due in part to building a brand, says Boatright, whose clients have included St. Supery and Marimar Estate, among others. Distribution is also a challenge for those in the cannabis industry. Among the speakers who addressed those issues was Zack Crafton, CEO of Big Moon Sky. Crafton made his name in the wine business at NakedWines, a platform that gave everyday wine drinkers a chance to invest in independent winemakers. He is doing something similar for cannabis as Big Moon Sky allows customers to order weed online and have it delivered to their door.